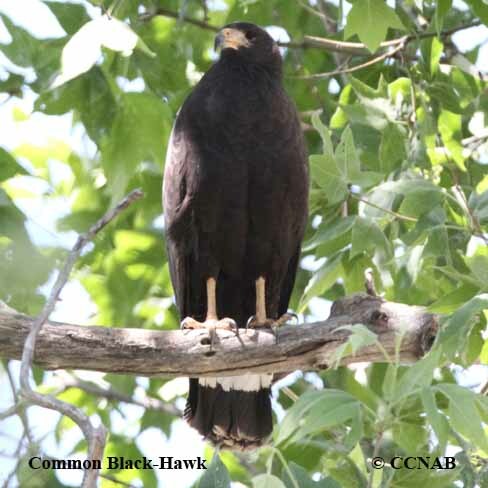 Species: The Common Black Hawk (Buteogallus anthracinus) is found in South-western areas of the USA. 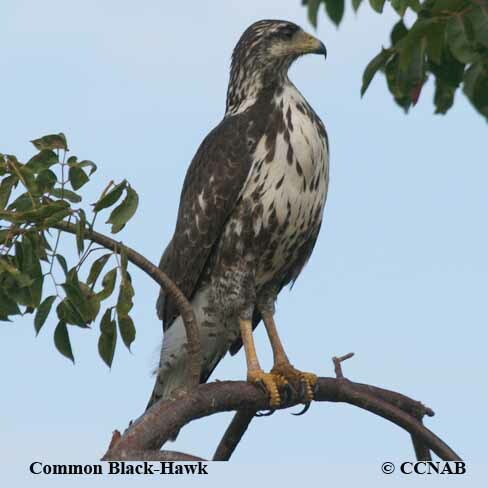 This bird of prey, a member of the buteo family, can be mistaken for a Zone-tailed Hawk, which is another all-black hawk, seen in their shared regions. 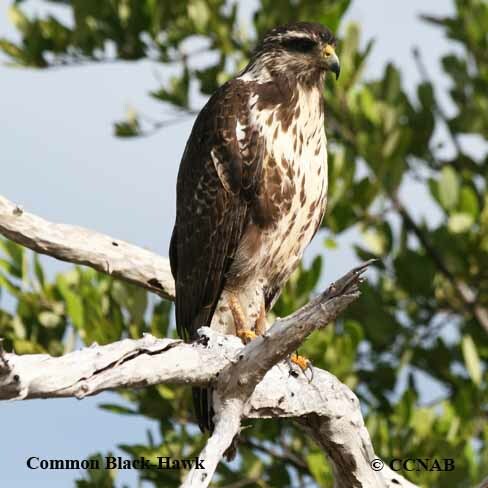 These hawks prefer to feed on reptiles, crustaceans and fish. Typical to see these hawks perched on a limb in a tree, rather than soaring, in search of prey. 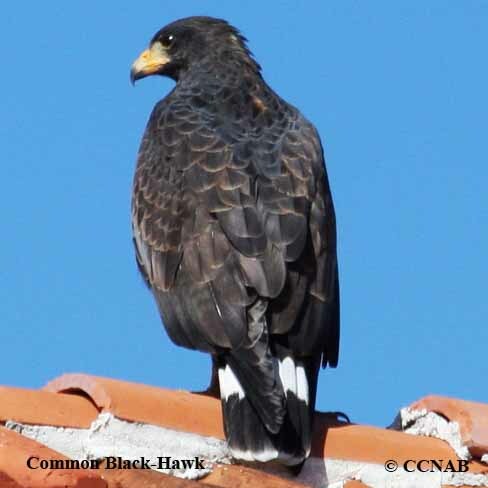 The Black Hawk seen in Cuba is a this time considered a sub-species to the Common Black Hawk seen on the continent. Distinctions: The male and female are similar in appearance, the female being the larger of the two. Adults are all black, yellow feet and ceres. Wide wings, giving the impression of a wide short tail. They have one large white tail band with small white outer tip. The juvenile, unlike parent, has brown body, heavy streaking on head, flanks and breast, tail has many small wavy bands. Nesting: One to three white eggs, with brown markings. 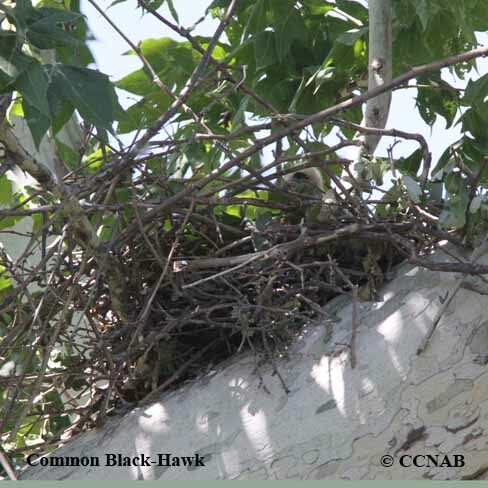 Large nest is built high in a mature tree, made from branches and sticks, usually located near water. Distribution: Birds seen in the USA, migrates into the south in the winter months. 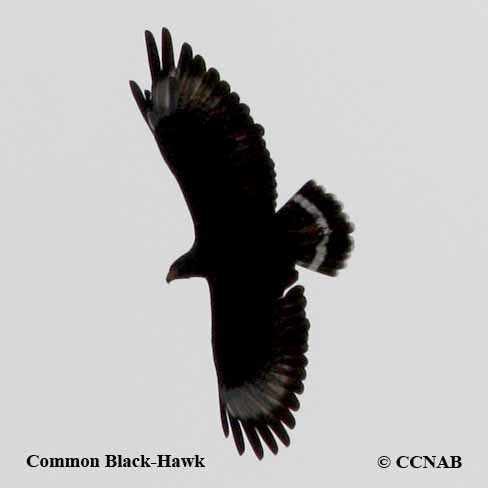 The Common Black Hawk seen in Mexico and Central America may or may not migrate. There is an established population in Arizona, where it is most likely to be seen. It a possibility, to see these hawks in New Mexico and Texas.